The Economy "X-Style" Collapsible Banner Stands are versatile and easy to setup. They are available with either our 13 oz scrim vinyl outdoor or 10 mil premium vinyl indoor banners and arrive in a slim nylon bag. These near photo quality banners are ideal for displays and trade shows. They set up in a few seconds and are 24" x 60" with grommets at the corners. 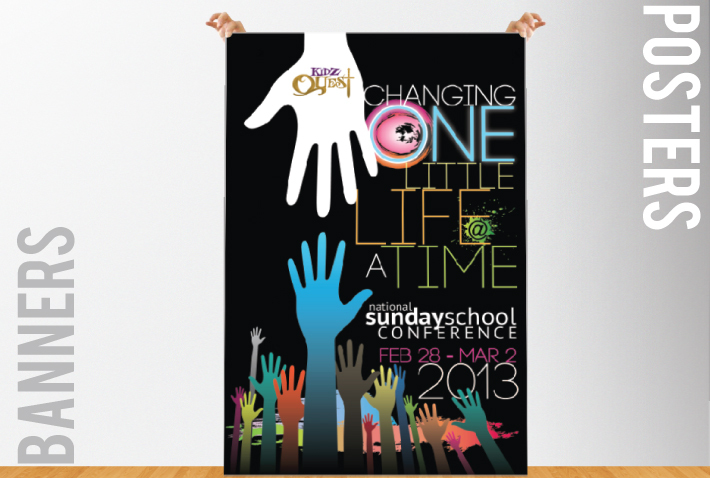 Specs: 24" W x 60" H, Outdoor/Indoor Use, Banners & Stands are also sold separately. The Aluminum Retractable Banner Stands are available as a kit with 10 mil indoor premium vinyl banners and are just as versatile as our "X-style" banner stands. This banner stands slightly taller and wider than the X-style kit (above). Specs: 33" W x 80" H, Indoor Use Only, Banners & Stands are also sold separately. Deluxe Banner Stands are a more stylish alternative to the regular retractable stands. This stand has a larger, heavier base with chrome accents make it stand out. Available as a kit with 10 mil indoor vinyl banner . Collapsible and portable; easy set up. If you want a durable vinyl print of your art, then consider a banner. There are 2 types of banners: Outdoor 13 oz and Indoor 10 mil. The Indoor variety (10 mil) is more photographic in print quality but not intended for outdoor use. Car/Van/Truck Magnets are printed on heavy-duty material and ideally suited for car door signage. These glossy magnets can also serve as temporary signage for construction sites or other changing work environments and offer long lasting outdoor use. Tear Off Cards: Postcards, Flyers, Doorhangers, etc. More convenient then ever, Tear-Off Cards are a perfect 2-in-1 promotion piece to get your name out and your customers to easily remember you. Tear-Off Cards have a perforated business card on the bottom, where your customers can easily tear-off and store. Tear-Off Cards offer a multitude of uses such as membership cards, coupons, raffle tickets, appointment cards, etc. Use the post card area to pass on information and the tear-off section to make a remarkable statement. 8.5" x 3.5", 11" x 3.5", 11" x 4.25"
Production/print turn time is 5-7 days on this item. No turn upgrade avail., sorry. The standard tear-off cards include 1 straight perforation 2 inches from the bottom edge. You can customize the perforation & other features of this item. All matte coated products will be printed with a matte coating on both sides. Booklets range from 4 to 32 pages printed & assembled on durable 100lb Book stock. Window Clings are near photo quality and ideal for signage on glass or glass-like smooth clean surfaces. They are printed on a glossy material and can be used indoor or outdoor. Whether it is for special promotions, restaurant menus, or informational purposes, Table Tents are a direct form of advertising. Available in two popular sizes, Table Tents will allow you to effectively communicate with your customers with ease. To save you shipping and time, they are shipped flat and are extremely simple to assemble! Wall Graphics are produced with low-tack adhesive backing on 8mil vinyl. This product is ideal for use on almost all surfaces; office or bedroom walls, laptops, and glass windows and is re-positional many times over. High quality prints on 17mil Artist Canvas printed and shipped, rolled up in a light and sturdy tube-perfect for shipping. This option is great for custom framing. Available in different sizes.